The problem: Old posts are invisible to new readers. As your blog grows, each new post pushes the old ones further back into the dust-bunny lair. Is there any way to bring your old gems back into the light? The solution: Create an archive page that highlights your best blog articles. A page is for permanent, undated content. You could make an archive page by using an easy shortcode, but that makes a list like this. Not very helpful! This blog is less than a year old, but already it has an archive of 80 posts. No reader will scroll down through all of those. So I created my Blogging Lessons page to focus attention on the most interesting and useful posts. My math blog contains nearly 500 posts — more than enough to drown in! How can a reader ever find her way through such a flood of information? My Best of the Blog page breaks the deluge into a series of top-10 lists for easy browsing. Don’t put every post you’ve ever written onto the archive page. Think about meeting people’s needs. What do your readers want? What are they looking for? On Blogging 2 Learn, my readers have different needs according to how long they’ve been blogging, so I it seemed natural to organize my page around the stages a blogger will naturally go through, from “What is a blog?” to long-term growth. I left out many unimportant posts, such as blog carnival announcements or NaBloPoMo updates. Let’s Play Math! readers are more diverse, ranging from parents of preschoolers to college math professors. I used my post categories as a starting point, then created sub-categories and sub-sub-categories until I had my long list of favorites divided into sets of approximately 10 posts each. Remember to use reader-friendly format: short paragraphs, bold headings, lists, and images. Save and click Preview frequently as you write! If you wish, you can add a line between each section of links using the HTML code <hr />. On Let’s Play Math!, I could have used Page Attributes to create parent and child pages, each much shorter than the Best of the Blog page I created. 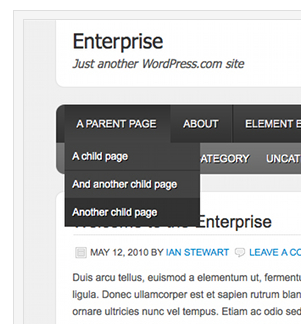 Many blog themes will display child pages in a convenient drop-down menu (click to see a larger image). But I wasn’t sure how my theme would handle child pages, and I didn’t want to risk having to change themes. Instead, I chose to keep everything on a single (very long!) page and to give readers Table of Contents and Back to Top links to guide their browsing. Name the target of your link using <a name="whatever"> before the target and </a> after it. For example, <a name="top">"Table of Contents" Quicklinks</a>. Write the text that will link to your target. Link the text to the target using <a href="#whatever"> before the link text and </a> after it. Don’t forget the # symbol! Save, click Preview, and check to make sure the links work the way you want them to. The quotation marks around “Table of Contents” and the square brackets around “Back to top” are not part of the HTML. I put them in because I thought they looked good on the page. Is this important enough to go on my archive page? But the work is worth it to bring long-neglected blog posts back into the light. So what do you think — is your blog ready for an archive page? This entry was posted on Monday, July 12th, 2010 at 6:13 am	and posted in Seasoned Blogger. You can follow any responses to this entry through the RSS 2.0 feed.